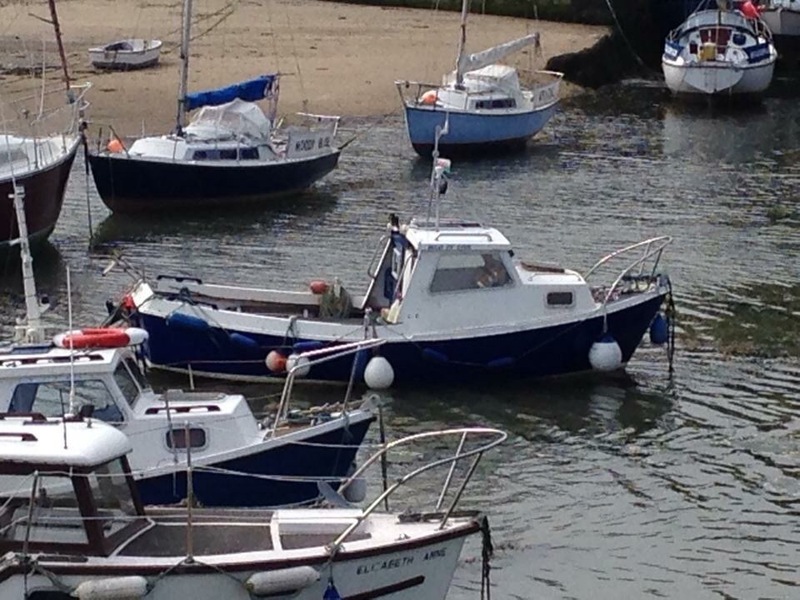 Sailing in North Wales – unless you keep your boat in a marina – is very seasonal, plus of course the weather!!! 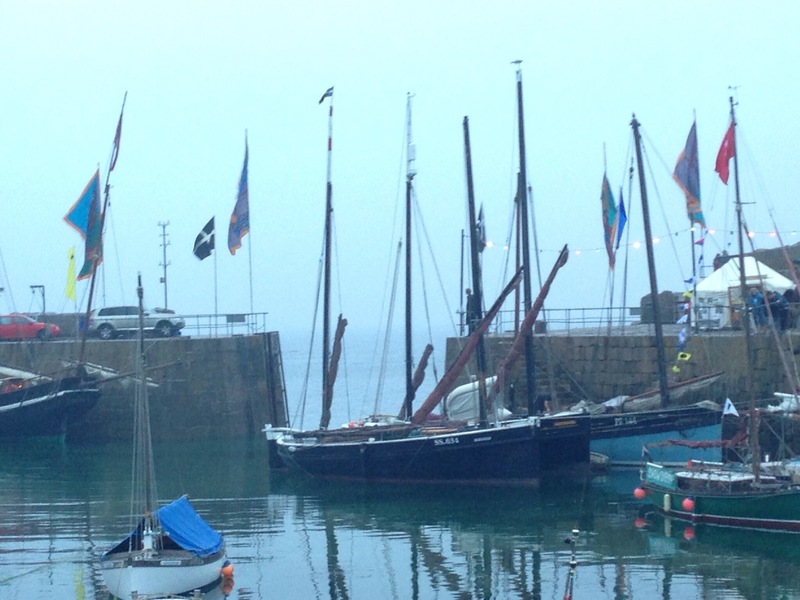 So after a couple more sails on Eira, and one on the CHA, that was the end of my sailing for 2014… how depressing! 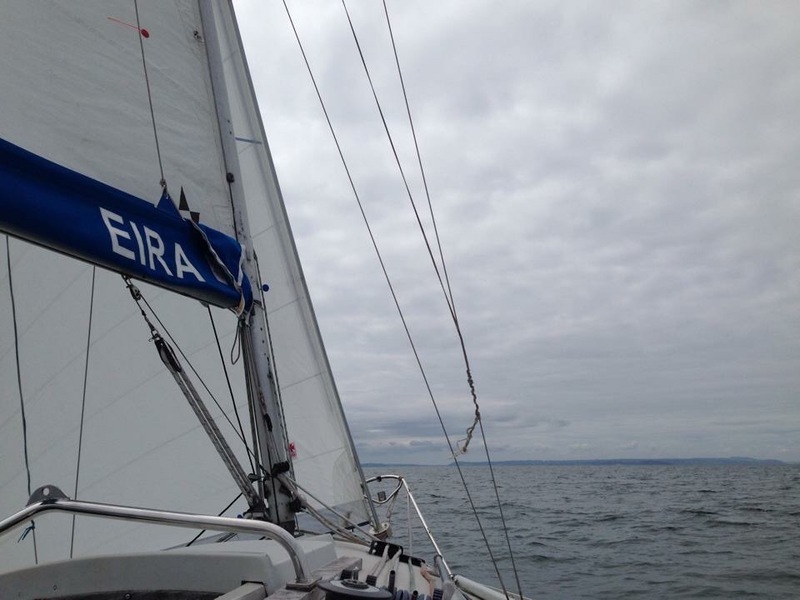 2015 didn’t prove too eventful either, I had met someone new and due to his ill health I didn’t want to leave him at weekends, so only one sail on Eira while Colwyn Bay’s Prom Xtra was on, a little race in the bay followed by munchies at the mooring…. bliss. 2015 disappears and 2016 appears on the horizon. 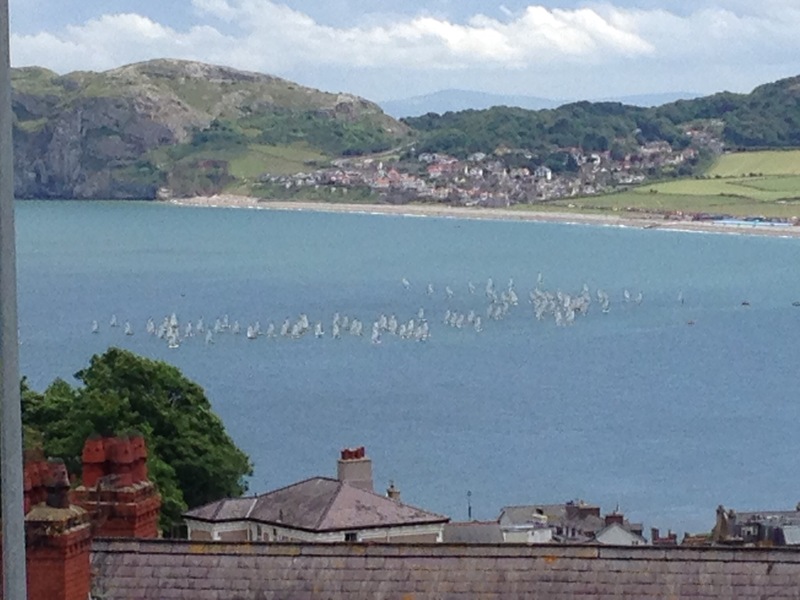 I am invited to become the secretary for Bay of Colwyn Sailing Club – I couldn’t say no to such an offer!!! After my appointment at the AGM in Feb 2016, the monthly meetings followed by a pint in the pub meant that I didn’t completely lose touch. 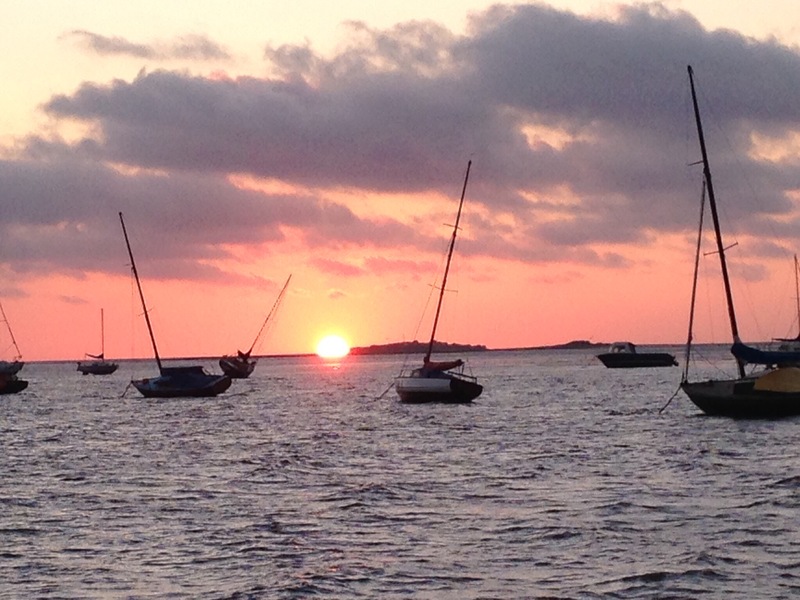 Oh but I did miss sailing…. 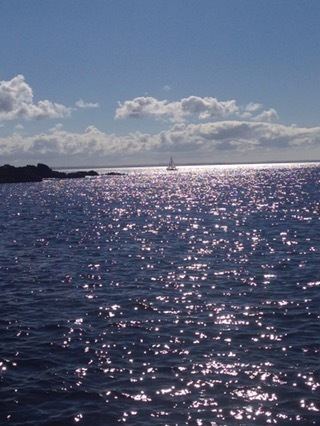 I just needed to get back to sea! It’s the beginning of May 2016. 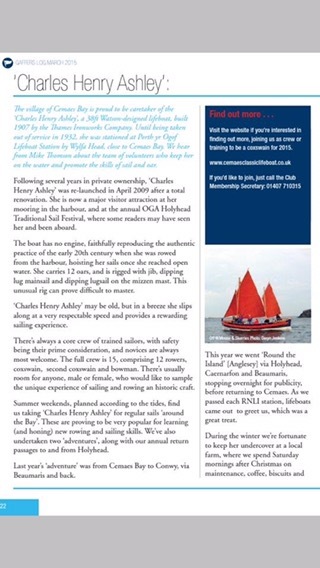 I had lost so much confidence in sailing (I had only been out sailing once for half a day in 19 months!). A conversation was had around holidays, I was advised that they should be spent doing something that you really want to do, so once you decide what you want to do, go for it! 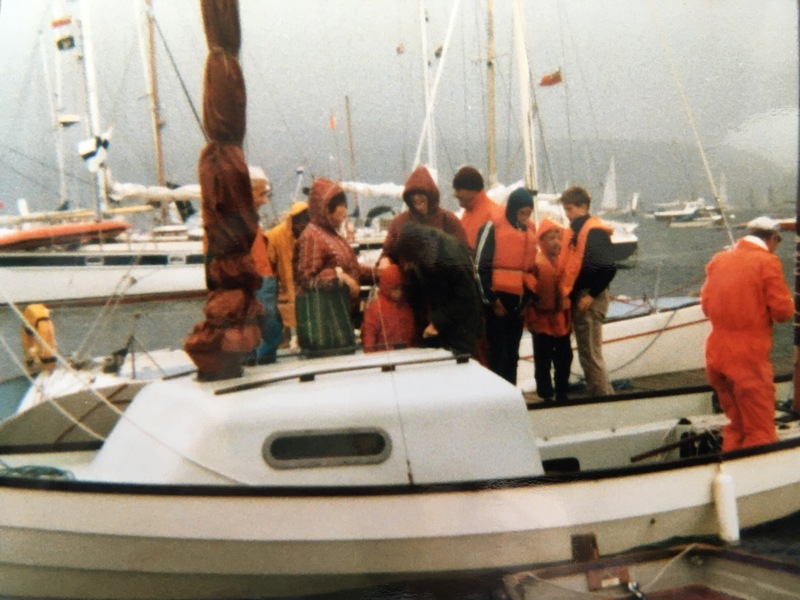 That night I was googling sailing schools, I knew I needed somewhere tidal, having had a look at local schools and locations like Tenerife, Cornwall and the Solent – I realised that as RYA prices were pretty much the same it didn’t really matter where you went. About 5 years ago I lost lots of weight, since then I am sooo nesh! 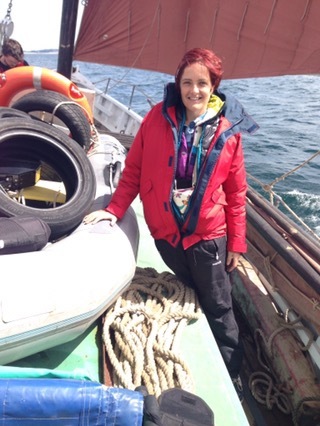 I get so cold easily, I thought that I would like to go somewhere warm, I emailed loads of sailing schools for availability on a Competent Crew course at May half term, a few got back to me from Gibraltar and Lanzarote with options but I chickened out…. just not brave enough to click “book”. 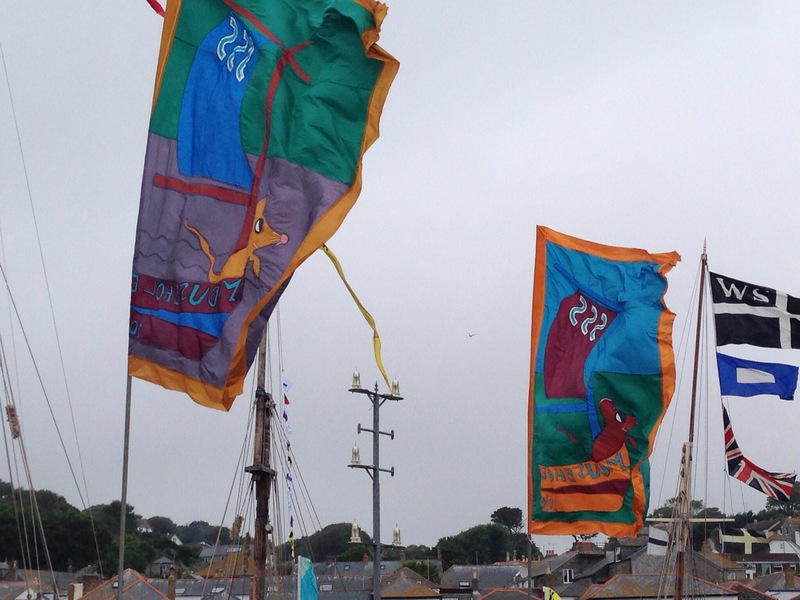 Well the 11th-13th July, I decided I would take any very first ‘solo’ holiday to Cornwall for the Sea, Salts and Sail festival. So having driven the long journey from North Wales I arrived late and tired at my campsite. Decided to walk into the village, eat and join in with the festivities. Well I found a nice restaurant and sat listening in to everyone around me. (Not sure I was cut out for eating in restaurants on my own- I literally had to bite my tongue to stop myself from joining in on others conversations!) 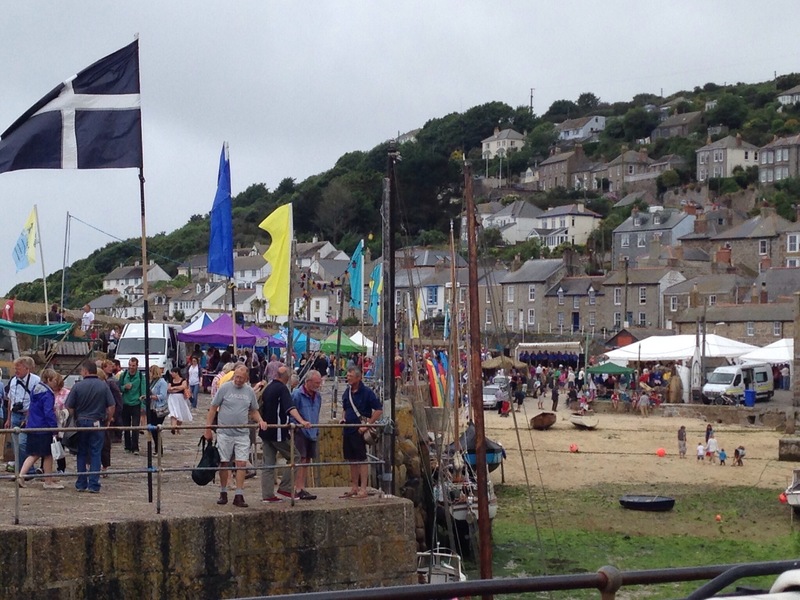 Well, after food I wandered down to the harbour where the crowds were being entertained by a local male voice choir. After a couple of drinks I decided to wander home to my campsite. Oh dear – hadn’t realised that it was a bit of a one way system! I got sooooo lost walking home!!! Tramping through fields in the rain. At one point I was scared to death by a badger! Eek! My phone had died so no chance of getting my whereabouts by GPS! 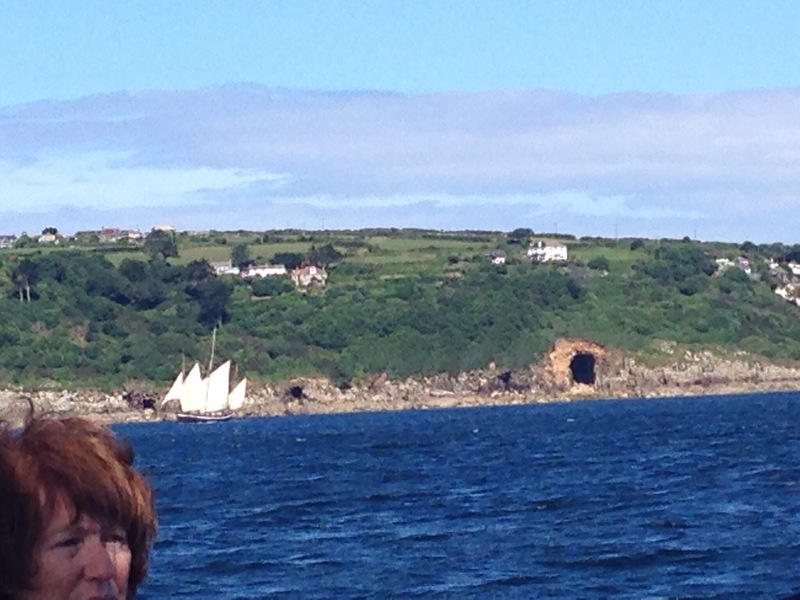 It was a beautiful day and there were quite a few of us traditional old boats racing past the “Mousehole” cave and back towards St Michael’s Mount. I have spent many happy weeks and months in Cornwall over my life, but that day was the most memorable ever because as an adult I got to see some of my favourite landmarks from the sea. 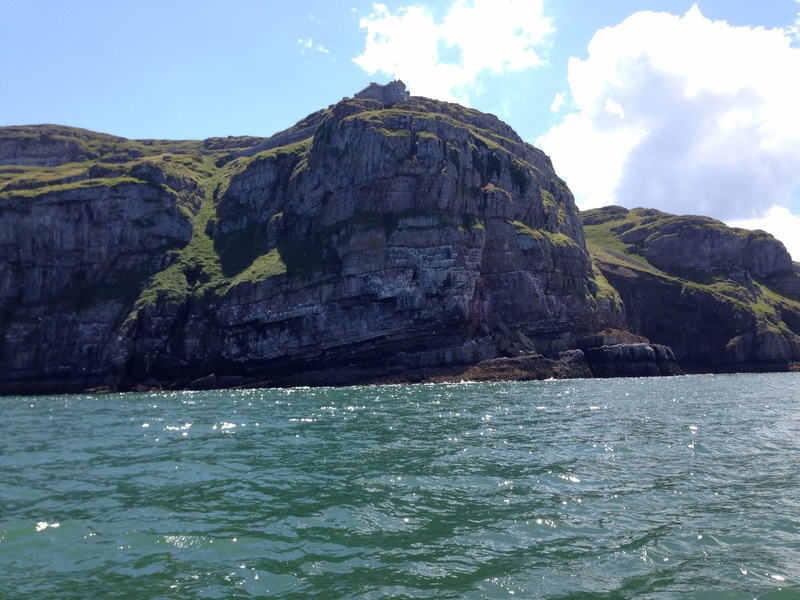 Here is a photo from the 6th July 2014 when we sailed around the Orme back from Conwy. (This was the day after my traumatic experience on Traumatic!). Cruising on Eira is like being part of a family, often joined by one of their grandchildren. 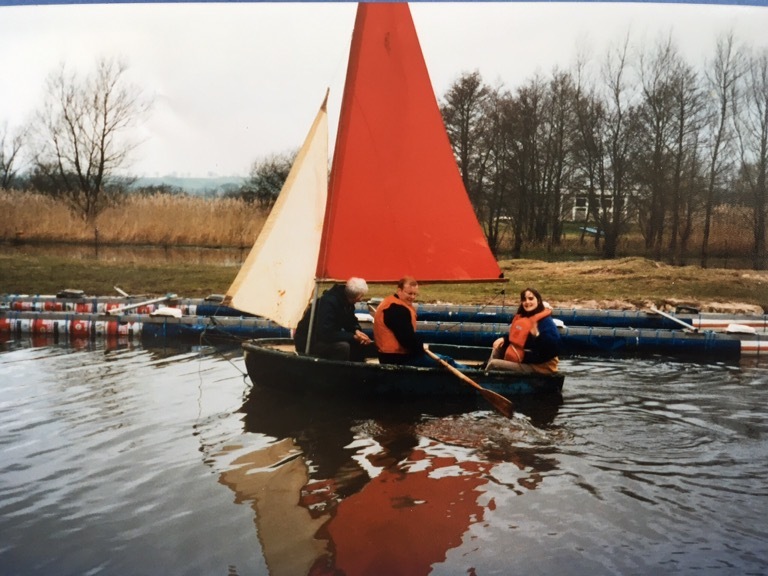 (Another generation being brought up on the water, what a brilliant education….) always well fed and watered. My bestest ever breakfast butty was on Eira! 16th July we sailed to the Menai Straits and anchored off shore from the gazelle pub, this was one of the occasions when turning up first was a drawback, we walked up the very muddy beach – one of us got our welly stuck in the mud and ended up rather filthy (but my friends, being always prepared, got the baby wipes out – they were needed a couple of times that evening!!). We then lit the barbecues and waited for our sailing club friends to arrive. One of the boats didn’t quite make it in time that evening and had one of those moments aground when you get the deck brush out to clean the sides and pretend it was on purpose!! Bless. 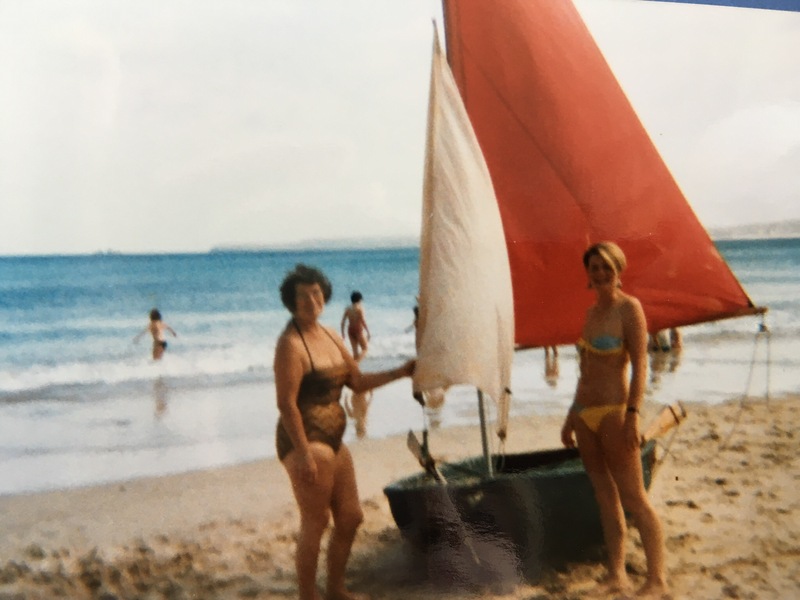 I have previously mentioned that my dad loves sailing, well he had to give it up at 65 because lifting the boat onto the roof of my mums car was taking its toll… so he took up windsurfing, then after a while gave that up in favour of a power kite (in his 70s by now). 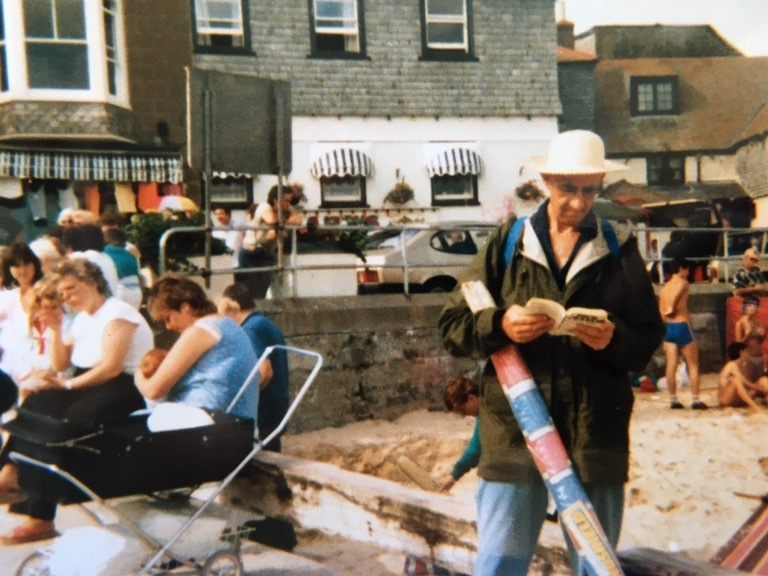 One particular memory always springs to mind, dad still in his dressing gown, with his power kite on Benllech beach, Anglesey. He said, “Joy would you mind putting your arms around my waist as the wind seems to have picked up a little?” So I put my arms around his waist, thinking, nothing will move us (I was rather heavy at the time!) anyway, up goes the kite. 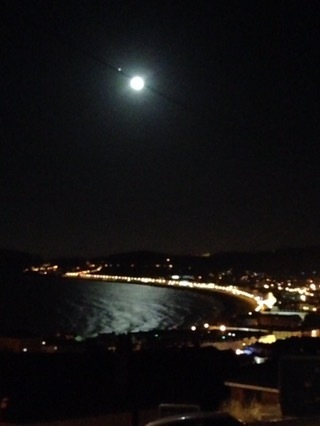 Immediately we were half lifted and half dragged along the beach!!! Argh!! Thankfully dad lowered the kite down quite quickly and we were back on terra firma. Phew!!! 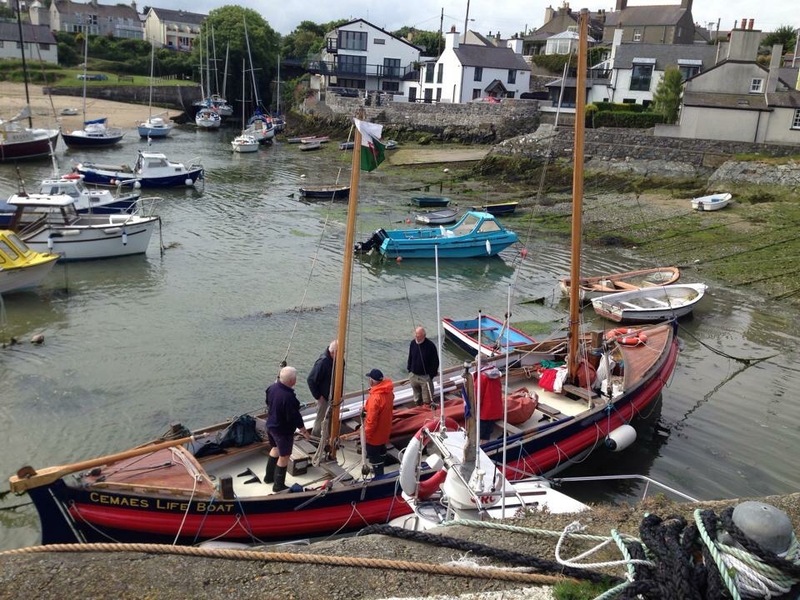 Anyway, my folks moved to Anglesey when my dad was 79, he bought an old fishing boat that was kept in Cemaes harbour. After only going out in it a few times because it needed work doing, he sold this at 85. 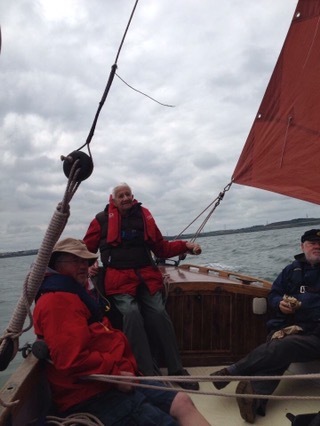 Anyway, in 2014 he had asked to me to go sailing with him on a 1907 decommissioned lifeboat. Definitely I thought. 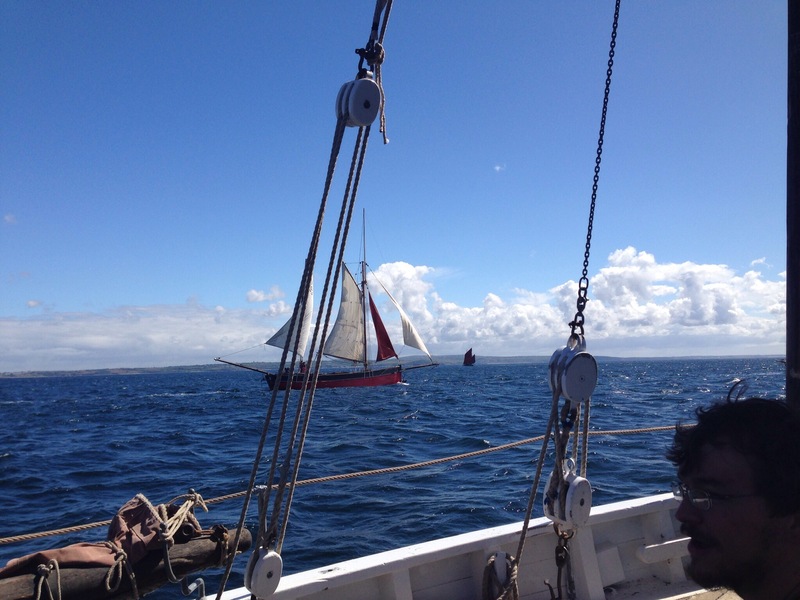 I’ve only managed to sail on her a couple of times – once spotting porpoise on our way back from the OGA Holyhead Traditional Sail Festival – but she is certainly very different to sailing a modern cruising yacht. I don’t know about you, but I love nature, I love to see sea birds and birds of prey, rabbits, goats and donkeys!! 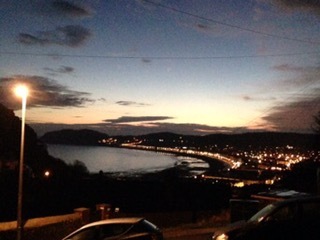 (I live on the Orme but that’s another story!) but I always love seeing the seals and dolphins at sea. So far I had a few sightings of North Wales sea life, however nothing had prepared me for what was to come. Now, I really did like the Cornish Crabber, maybe it was because it was a cool aqua colour (me being a girl lol! 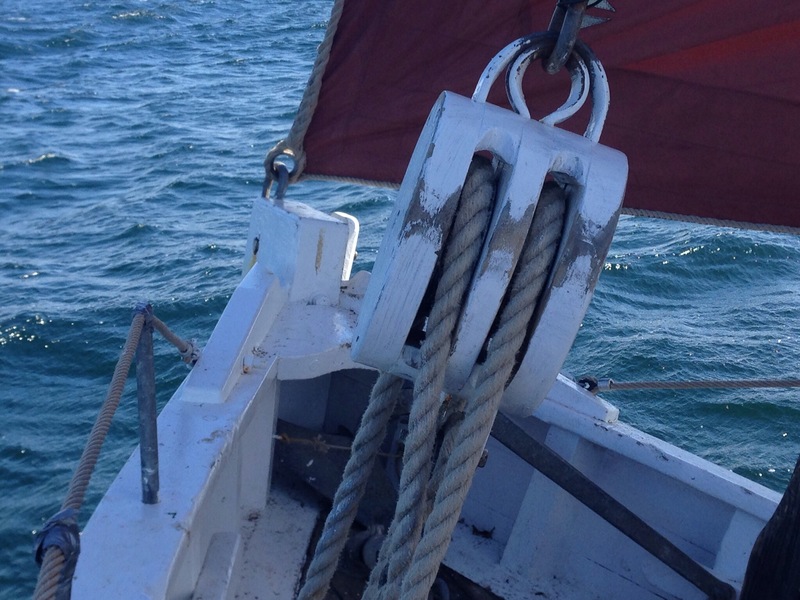 ), or maybe it was because it was really responsive at the helm, or maybe it was because it was the first boat I sailed in on the sea, but one drawback was that it was a day boat without a bilge keel (for those of you who have no idea what this is, two keels underneath both sides of the boat that enable it to stand upright without water) so my pal used to sleep on his, and hope that he wouldn’t end up on the floor depending on which way the boat settled when the tide went out. I however, had been introduced to the exceptionally kind hearted owners of Eira, who took me in, under their wings in their pride and joy. Eira could not only accomodate an extra body, but had a heads!!!! Whoop whoop!! no more thoughts of having to pee in a bucket (which I just could not do!!!). Two fabulous folk who happily let me stay on their boat just because I was a friend of a friend. Hey, I could have been a complete nutcase!! Oh yes, I was haha! Never mind they soon found that out and I seemed to fit in. I was introduced to their eclectic mix of music including my favourites Queen – ‘I’m going slightly mad‘ and the lovable ‘Dominick the Donkey‘! So we kept on, past all the windmills along the North Wales coast, to Hilbre. As we arrived, there looked to be sand dunes with loads of rocks along the shoreline. 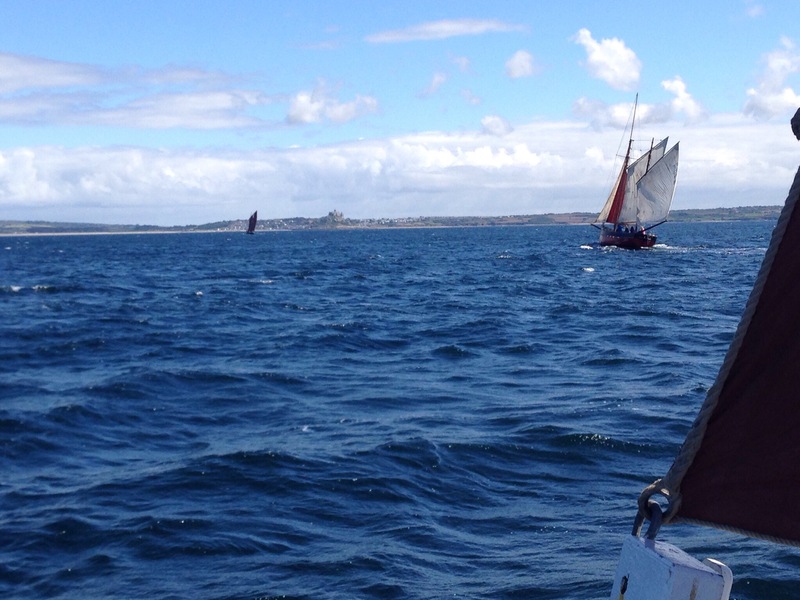 We dropped our anchor as close as possible, on our approach all the rocks started moving into the water! – it was seals, hundreds of the things! Anyway, after a while they came to investigate us – honestly! their breath was sooooo smelly! Very fishy – possibly not surprisingly considering their diet! 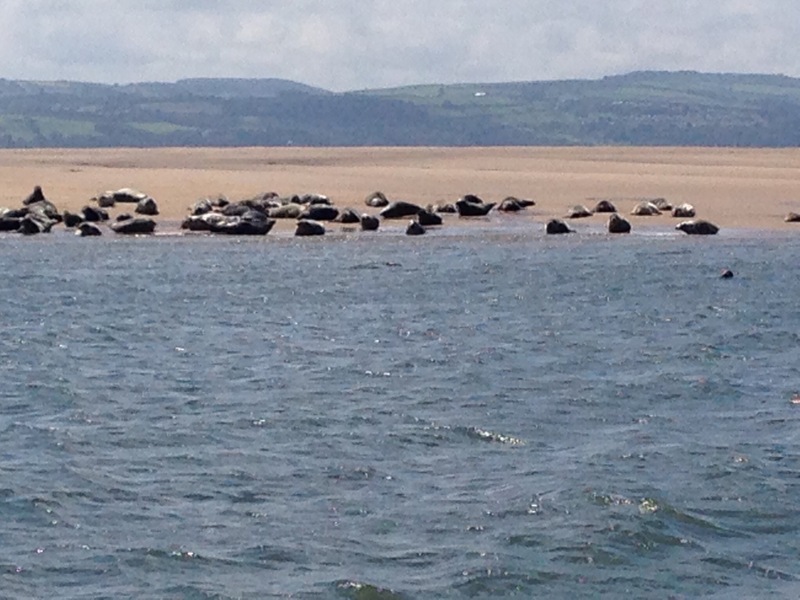 It was an amazing experience to be surrounded by so many seals. After a while of lazing in the sun and enjoying our new friends, we went off to find a mooring. It was a beautiful sunset that night. Some of the boats from our club joined us, one left it slightly too late and ran aground (they shall remain nameless!). 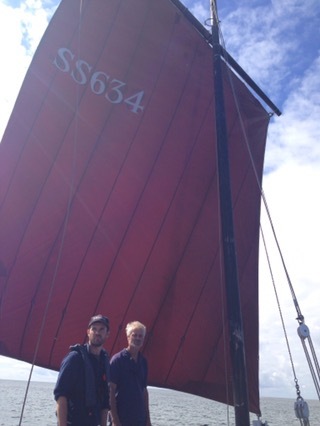 The next day we sailed back to Rhos. 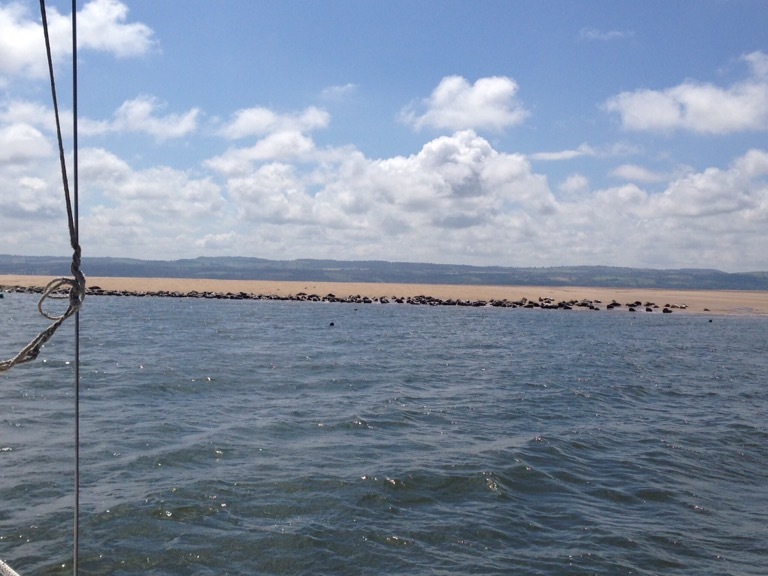 What a buzz though – I have seen many seals and dolphins in my travels but nothing yet has surpassed that weekend… I always have to admire them and appreciate their beauty…. just make sure you have a peg handy for your nose for those bad breathed seals! Honestly – it was a real head turner! 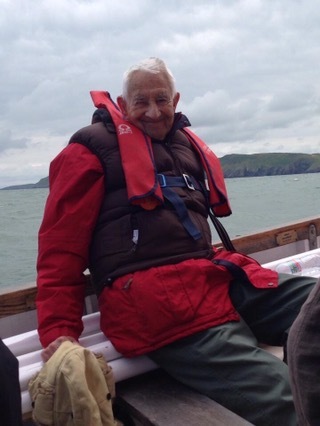 Dad in his blue and white towelling dressing gown and straw hat sailing this boat. 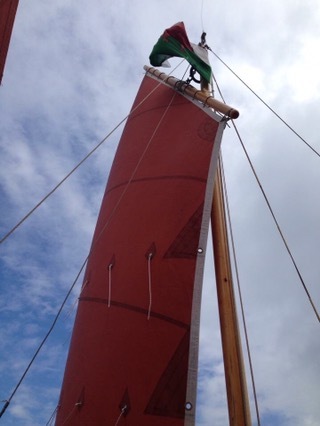 I remember visiting my cousins in Falmouth and going for a sail, there were quite a few of us and I was down in the cabin, I remember feeling a little queasy! Here is a photo – I think I am the miserable looking child in the middle!!! 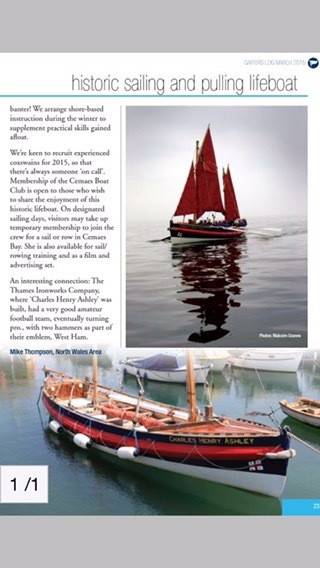 A lot later I can remember my uncle giving us his wooden hulled boat, this was a little bigger and I remember a trip to the Mumbles, me, Mum and Dad. We got there, the wind had picked up and the sea had got a little lumpy. After getting the boat in the water and it heeling over way too far with no more reefs to take in, we gave up on the mission and decided to go for coffee. I had a change of clothing, but guess who forgot? As we were absolutely soaked to the skin my lovely Dad had to wear a long mac with wet pants to the cafe, maybe mum and I should have been embarrassed but all we could do was fall about laughing at poor dad who was a shivering wreck and looked very dodgy! To make a long story short, that boat is now the dark squares on my chessboard which my dad made for me. 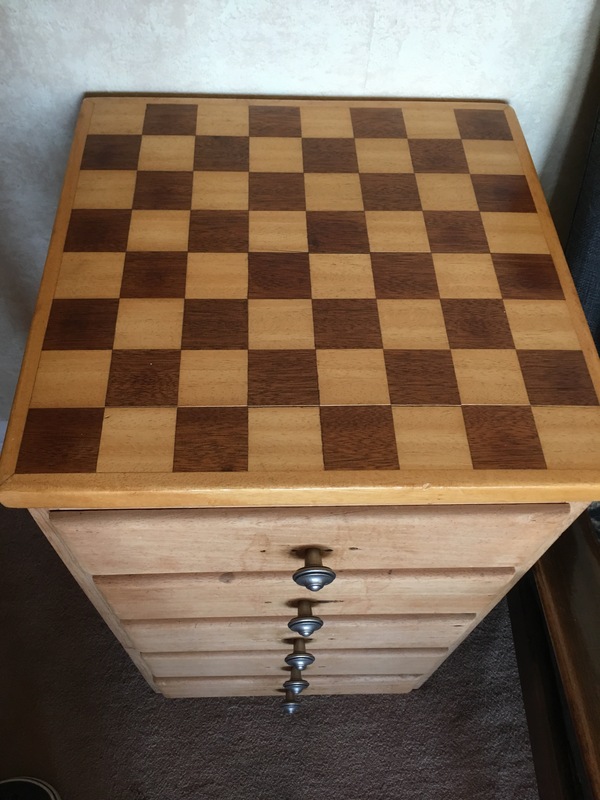 I love that chessboard, but can’t play chess! Definitely need someone to teach me! Any offers?? ?